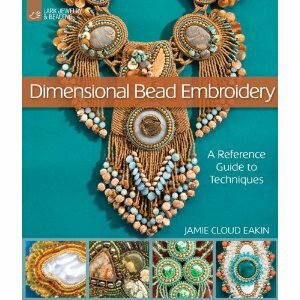 One of my personal favorite bead embroiderers, Jamie Cloud Eakin, has a new book published by Lark called Dimensional Bead Embroidery. What I really really like about this book is the exact thing that I've heard others criticize about it: it is a reference guide, almost an encyclopedia of techniques, and not so much a project book. Oh yes, there some projects in it, of course, and they are lovely. But they are not really the main attraction, in my opinion. Jamie has eight chapters full of information on everything you'll need to know to add focus and interest to your basic back stitch. She covers materials and tools, basic stitches, basics of design, adding components, dimensional surface stitches, bezel stitches, edging techniques, and attachment stitches. Although she covers some of the same topics as in her very popular book Beading with Cabochons, all of the techniques in Dimensional Bead Embroidery are new. If you already own Beading with Cabochons, you will no doubt want this book as well. I think that the methodical way that Jamie takes you through each topic is excellent, and it will make it extremely easy for you to find exactly the portion that you want to refresh on in the future as you create your own works of art! I totally agree with you. My go to reference for my first bead embroidery was a wonderful tutorial I found on the web...by non other than YOU!! Then I got Jaimie's cab book. It remains my go to book. I bought the new one as well, and I am totally happy with it. I appreciate he method of teaching technique. The more I read about this book, the more I'm convinced I'm going to buy it! I love the idea of a technique-based book instead of a project-based one, because I've never been all that excited about recreating other people's work -- more about taking things in my own direction. I wish there were more jewelry reference guides! I've already purchased this Jamie's book and it's packed to go to Florida with me! I really like some of her projects and her hints are great! My Christmas present to myself. Thanks for letting others know about it as well. Thank you for the wonderful review. I just wanted to clear up what may be a misunderstanding. While both books have chapters for edges, bezels and attachment techniques, the ones in Dimensional Bead Embroidery are all new... So... you can add to your toolbox for even more design choices when you make your fabulous designs. I bought that book and I absolutely LOVE it, she has so many great techniques that I did not know about. I have Sherry Serafini's books which I love, but this one added some new ideas.